Wisconsin Builders Conference – Why You Should Attend! 1. Education! Seminars by industry leaders on business and building will be offered, along with courses on marketing, social media and much more. These seminars can help you earn your continuing education credits for certification in different areas. 2. Networking! Network with fellow builders, associates and make new connections. Open to all industry professionals! 3. Gain the Edge! Jump start your year with new business tools to remain competitive. 4. Vendor Showcase! Meet industry experts and see innovative products you can add to help your business stand out amongst your competition. 5. Award Recognition! Some of the winners to be recognized include Builder of the Year, Associate of the Year, Rising Star, new entrants into the WBA Hall of Fame and Above, Beyond and Then Some winner. Winners will be announced Thursday night at the President’s Recognition banquet. Four Tips to Schedule and Manage Construction Projects With Ease! Routine Maintenance Will Extend Your Roof’s Life and Save You Money! 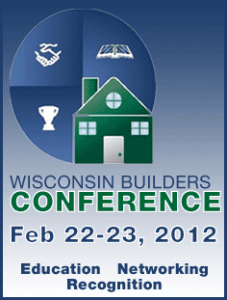 Three Upcoming Events in Northeast Wisconsin for Builders and Contractors!